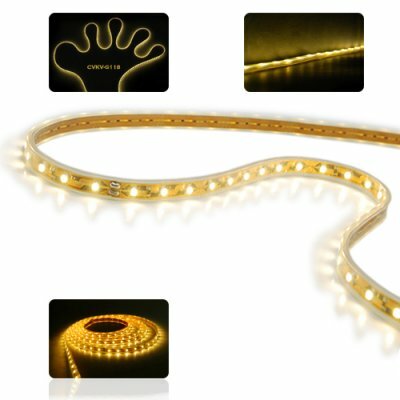 Successfully Added Premium Water Resistant Outdoor-Suitable LED Strip Light - Warm White (5 Meters) to your Shopping Cart. Warm white colored LED strip light that is 5 meters long. This 5M Waterproof LED Strip Light is as indoor and outdoor use lighting product that is extremely flexible and can be used as decorative lighting for trees or landscaping as well as permanently mounted on structures such as walls and coves. Installation is very quick and simple, you can wrap the strip around your landscape plants, or use clear silicone gel / two sided tape / u-shaped style staples to attach it to any flat surface. No special tools or wiring is required to install this lighting product. Make your indoor and outdoor spaces shine bright this year with some energy efficient LED lights. This LED Strip Light is in stock right now, so order yours to start enjoying the benefits of affordable architectural lighting! Note that when using this outdoors, while the rope light itself is waterproof, the power supply IS NOT. The power adapter MUST BE KEPT DRY AT ALL TIMES. Yes. It can be used on any any tree. This 5 meter length can highlight many small to medium sized trees. It is simple to install, U-shaped construction staples/clips can be used as well as CAT5 style cable mounting clips. Caulk or clear silicone gel is also popular for installing flat string light. Tape, especially the double-sided type, also works well for indoor installations. Dropshippers - Our current LED lighting products has continued to be popular since we introduced them last year. This is a product that will net you some steady sales from people looking to embrace LED technology. Nice LED strip for a very low price. The power adapter is strong enough, The light is quite strong. I'm not sure that both ends are waterproof, but this could be easily checked and fixed if needed. NIEDROGI GADZET. KAPITALNIE ROZPRASZA MROKI GRUDNIOWYCH NOCY. MARRY CRISTMAS FROM POLAD FOR EVERYBODY.